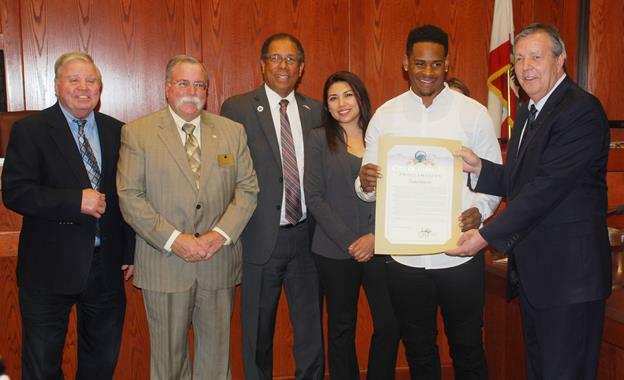 PALMDALE – At a packed meeting Wednesday night, Denver Broncos linebacker Todd Davis was honored by the Palmdale City Council. “A Super Bowl winner here in our community, that is so awesome!” exclaimed Palmdale Mayor Jim Ledford, as the audience rose to its feet and applauded. Ledford congratulated Davis on all his accomplishments, calling him a true inspiration to residents and young children in the Antelope Valley. “You’re the man, and we’re glad to have you in our city of Palmdale,” Ledford said. Davis used the platform to talk about giving back to the Palmdale community. He said he would be hosting his second annual youth football camp in July, but this year the event had been expanded to include three days of activities. A charity golf tournament would held on July 14, followed by a charity bowling event on July 15 featuring some of his Broncos colleagues, Davis said. The Todd Davis youth football camp would be held on July 16, he added. “We want to make it free for all the kids, so we’re trying to get as much sponsorship and as much help as we can now to make sure that every kid who wants to be there can be there,” Davis added. The Palmdale City Council then presented Davis with a proclamation declaring July 14, 2016, as Todd Davis Day in Palmdale. Davis began his football career at age 9, playing for Highland Youth Football. He enjoyed a successful high school career at Paraclete High School, with 119 tackles as an outside linebacker. He attended Sacramento State where he was named defensive MVP, received all Big Sky Conference Honors, and had 131 tackles in his senior year. Davis was originally signed by the New Orleans Saints in 2014. He was released, but then signed by the Denver Broncos later that year. 2 comments for "Super Bowl champion honored"
“Proud to be living in the Antelope Valley? !” You must be on some strong drugs! Todd, You make me feel proud to be living in Antelope Valley!! Thank you for taking the time to be with us. God Bless Angel:-) DENVER BRONCOS ROCK!! !